The Scoring Chances books by Avon Gale have been on my to-read list for sometime now. 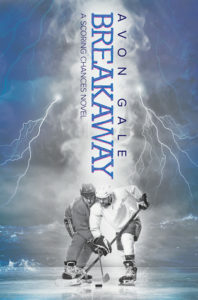 On the cusp of the 2016-17 hockey season, it was time to take the plunge with Breakaway and I’m so glad I did. The story centers on 20-year-old Canadian hockey player Lane Courtnall who is drafted to play in the ECHL’s Jacksonville Sea Storm. He’s a good hockey player, but lacks social skills and starts the season alienating his teammates. That all changes we has an on-ice smackdown with Jared Shores, an enforcer with the Sea Storm’s arch rivals, the Savannah Renegades. Not only does Lane make amends with his team, he later runs into Jared and a local bar and the two strike up an unlikely conversation over drinks and chicken nuggets. That meeting at the bar, leads to a one night stand and then a romance that stretches through their season. Lane helps Jared re-discover his love of hockey and to help him was away the memories of the man who’d betrayed him years ago. For Lane, Jared is able to help him discover that it’s okay to be gay and play hockey. He’d like to find a way for Lane to curb some of his awkwardness and find a filter so he thinks before he speaks, but that just doesn’t happen. Lane was a delight. His lack of social skills is both funny and, at times, painful to read. He reminded me a lot of Sheldon from Big Bang Theory in his complete lack of self-censorship. Watching Jared’s evolution from grizzled veteran player to someone playing with the enthusiasm of someone just starting out was wonderful. Even better are the scenes of Jared and Lane figuring out their relationship as their love grows through the season. Their back and forth with each other was funny, sweet, touching and moving, especially when each told their stories on why going for love was difficult for them. Lane’s best friend Zoe was a standout among the supporting cast. She was so awesome dealing with Lane’s sometimes outlandish statements. I wouldn’t mind seeing her get her own book in the series at some point. Lane’s teammates Riley and Ryan were great too. Ryan’s evolution from party boy to something else (trying not to give spoilers here) and Riley as solid friend were fun too. Gale created characters I couldn’t help but love, so I went from Breakaway right into Save the Game. Already a couple chapters in and I can already tell I’m going to love Ryan’s story.